The Asian Human Rights Commission (AHRC) has received information that Ms. Sujani Weerakkodi, a government employee working as a Science and Technology Officer was verbally abused and physically assaulted by a senior Buddhist monk at her offices on 22 January. Her immediate superior and the police refused to take action against the monk due to his political influence and the victim was later abused at both the Gampola and Kandy hospitals. Furthermore the doctors and nurses tried to portray her as being mentally unbalanced due to the monk’s interference. This is the second case of a Buddhist monk abusing women and then hiding behind his authority within two weeks and it speaks ill of the government of Sri Lanka in that it allows such incidents to happen without offering redress to the victims. This case is yet another illustration of the exceptional collapse of the rule of law in the country. Ms. Sujani Weerakkodi ( 34) of No: 343/A, Kahawatugoda, Murutalawa (Peradeniya) in the Kandy District is a married woman working as a Science and Technology Officer attached to the Udapalathe Vidatha Resource Center under the Ministry of Technology and Research. Her husband, Sanjeewa Dharmaratne is a businessman. According to the victim, on 22 January 2013, while she was performing her duties at her office at Gampola, Bowela Wimaladhamma Thero, the present owner of the rented office premises suddenly appeared at the office and abused her verbally using filthy language. The Thero, has, to-date, never explained the reason for his tirade. Ms. Sujani states that she has always carried out her official duties diligently and had a cordial relationship with her fellow staff members and the people who come for her services. She states that although the official premises belong to the Thero the rental contract of the premises is departmental matter and she has never been involved with any of these concerns. She further says that she has not, in any way, done any wrong to the Thero and was shocked by his behaviour. While he was ranting at her she asked for the reason for his abuse. Rather than explain he simply continued to shout at her in a threatening manner. The Thero threatened her; telling her not to deal with him in the same manner in which she deals with her staff. He continued to act in a very violent manner by assaulting her and throwing a chair about the room. When she tried to shout in order to call for help, the Thero kicked the chair on which she was seated causing her to knock her head against the wall. Though it caused severe pain in her head, she managed to make a call to her husband and informed him about the assault. Her husband who heard the threatening voice of the Thero over the phone, instructed her to make a complaint to her immediate boss, the Divisional Secretary (DS). Even though she went to the office of the DS to complain, the man totally ignored her. Hence, she waited at DS’s office for her husband to come. He arrived at around 11am with her aunt and they met the DS and asked him to handle the matter in his official capacity. However, he refused to take any action against the Thero, saying that the Thero is very powerful and that he is the Adikarana Sanga Nayaka (Chief Leader of the Buddhist discipline matters in the region). Moreover, he asked her to apologize to the Thero since he is a reverend. Then, they went to the Gampola Police Station and lodged a complaint regarding the incident. The police officers then gave a note for her to get admitted to the Gampola Government Hospital. By that time she complained of feeling ill and as if she wanted to vomit and was dizzy. Without treating the head injuries, the nurse injected her with something and she slept for the rest of the day. When she awoke the next day there was a lady at her bed, shouting and disturbing her. The victim then complained to the doctor and the doctor removed the lady from her bedside but she constantly returned and irritated her. The woman accused her as being mentally ill. When her husband arrived he asked the nurses whether he could keep someone with her in the hospital to look after her, but they refused his request. The husband attempted to get her discharged but nurses refused this so the husband went to the Human Rights Commission (HRC)’s Regional Office in Kandy and lodged a complaint against the Thero, the Officer in Charge of the Police Station (OIC) of Gampola and its officers, Divisional Medical Officers and Gampola Government Hospital (DMO) stating that Gampola Police Station, failed to investigate her complaint (C.I.B. 3 178/352) and that the Gampola Government Hospital failed to give her proper treatment after she was admitted. Later Ms. Sujani’s husband returned to the hospital and took her to the Kandy Teaching Hospital where she was treated by Dr. Ranjith Wickramasinghe, the Neurologist for her head injuries. In the Kandy Teaching Hospital she underwent a CT scan but continued to complain of dizziness. On 25 January the victim saw a nurse whom she identified as a nurse from Gampola Government Hospital, giving instructions to a nurse in her ward. Hence the victim got scared and made a call to her husband, requesting him to remove her from the hospital. Thereafter according to the victim, they kept her on the floor and harassed her by saying that she was insane. Some nurses threatened her by saying that police would arrest her. Since she was not able to tolerate this harassment she made a complaint to the Hospital Police Post and asked them to record a statement. The police officers promised to do so but never acted. Later on the morning of 26 January a nurse came and tried to give her an injection but Ms. Sujani refused. The nurse then dragged her to a chair to which she tied the victim and injected her against her will. That night she was left to sleep on the floor again. The next day when Sanjeewa, the victim’s husband came to see her with a retired teacher, the victim was still on the floor, unconscious and half naked. Sanjeewa took photographs of the victim’s condition but the nurse from Gampola Hospital arrived dressed in casual clothes and shouted at the husband not to take photographs. The same day a Judicial Medical Officer (JMO) examined her and further made a referral for a Consultant of the Psychiatric Unit. She was examined on 28 January and asked her to come with a relation. The Psychiatric Consultant confirmed that she was perfectly well and that she is not in need of any treatment. Ms. Sujani was asked by the Gampola Police Station to come to the station for an inquiry on 30 January at 10am and when they went to the police station, the officers said that the Thero had already left and that the inquiry was over. Furthermore, the police officers told her that they cannot do anything against the Thero as he is politically very powerful. The victim’s husband then complained to the Deputy Inspector General (DIG) of Kandy but so far the police have neither arrested the Thero nor made any progress in the investigation. The victim and her family feel that she will not get any justice as the police will not conduct any investigation into her complaint as the Thero will influence the police, the doctors and even the DS. The victim who is still suffering from head injuries seeks justice and redress. She feels that she was harassed by the Buddhist monk and that his influence extended to the Gampola and Kandy hospitals as the hospital authorities tried to present her as a psychiatric patient. 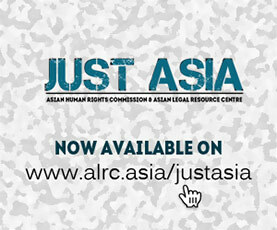 The Asian Human Rights Commission (AHRC) has reported innumerable cases where state law enforcement agencies have shown the breakdown of law in investigating crimes and bringing the suspected persons before the law so that they may be punished after successful criminal proceedings. The victims of crimes face enormous harassment, and on some occasions the witness and the victims have been killed by the perpetrators. The AHRC has continuously urged the state of Sri Lanka for the necessity of adopting a witness protection law and implementing a successful witness protection mechanism to verify the smooth running of rule of law system. The state of Sri Lanka is bound to implement the legal provisions of the International Covenant on Civil and Political Rights (ICCPR) as it has signed and ratified the convention. Nevertheless the lack of protection offered to those who are willing to take cases against criminals, abusive police officers and the state authorities, means that the law is under-used and this continues to be employed as a tool by the police to harass people. This not only takes a long-term toll on the victim and his or her family, but on society as a whole, by undermining civilian respect for the law and encouraging impunity. Further state of Sri Lanka has sign and ratified the Convention on the Elimination of All Forms of Discrimination against Women (CEDAW). However the state agencies have failed to implement the protective laws towards the women effectively. Please send a letter to the authorities listed below expressing your concern about this case and requesting an immediate investigation into the allegations of violence against women and refusing justice for the victim by a religious priest and state officers and the prosecution of those proven to be responsible under the criminal law of the country for misusing powers of a state. The officers involved must also be subjected to internal investigations for the breach of the department orders as issued by the police department. Further, please also request the NPC and the IGP to have a special investigation into the malpractices of the police officers for abusing the state officers’ powers. Please note that the AHRC has also written a separate letter to the United Nations Special Rapporteur on Violence against Women on this regard. I am writing to express my serious concern over the case of Ms. Sujani Weerakkodi ( 34) of No: 343/A, Kahawatugoda, Murutalawa ( Peradeniya) in the Kandy District. Ms. Sujani is a married woman working as a Science and Technology Officer attached to the Udapalathe Vidatha Resource Center under the Ministry of Technology and Research. Her husband, Sanjeewa Dharmaratne is a businessman. I request your urgent intervention to ensure that the authorities listed below instigate an immediate investigation into the allegations of violence against women and refusing justice for the victim by a religious priest and state officers and the prosecution of those proven to be responsible under the criminal law of the country for misusing powers of state officers and for wrongful prosecution. The officers involved must also be subjected to internal investigations for the breach of the department orders as issued by the police department.